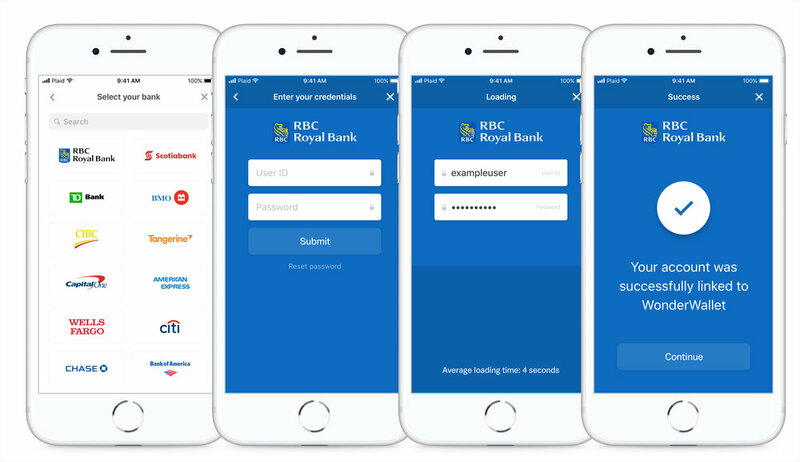 Open banking is happening, but it feels different than expected. The story is not the gradual digitization of incumbents through Application Programming Interfaces that liberate data and modernize incumbents. Incumbents -- other than a select few giants (e.g., JPM, Goldman, BAML, BBVA, Santander, DBS) -- are primarily performing Fintech Kabuki to look good for public equity investors. And even more, their financial performance is driven too much by exposure to capital, interest rates, regulation and compliance, physical retail costs and other risk-averse incentives, that tech-first approaches do not matter. The ice cube is melting slowly, like the media industry in early 2000s. This is how you get to absurdist PR poetry: in advertising their merger of equals, creating a $300 billion deposit bank, BB&T and SunTrust proclaim: "Two Legacies, One Future". Yes, the future of Planned Obsolescence. Instead -- open banking looks like this. London-based Bud has raised a $20 million round from Goldman, HSBC, Investec and Sabadell to sit on top of legacy, obsolescent systems and pull data out of them into modern architecture. The firm has 80 fintech partners, and can connect third party developers into products like credit cards and insurance, as well as categorize the data exhaust coming from these sources using machine learning (but who couldn't at this point). Or take Tink, raising EUR 56 million in new funding from Insight Ventures and the Nordic banks, similarly going after the PSD2 as a service opportunity. Yet another example is Raisin, which just got $114 million for interest-rate shopping across the continent. The company has placed $11 billion across 62 partner banks; 62 banks that offered the most interest to customers, and therefore made the least money. This technology intermediator is accumulating the long tail of capital as product, while owning the customer directly. So yes, these are all little bits. But such is the nature of erosion, until the rock-face breaks off into the ocean with a final splash. We note the investors in these entities are from the financial industry, so that creates a hedge. But we can also imagine Amazon, with a net promoter score 3x better than the national banks, snapping one of these apps as the industry yawns. Bud and Tink are cloud services, which could sit in AWS for finance. Raisin is a comparison shopping engine, at home in Prime. Neither make financial products, instead relying on the industry to get hollow in the middle and provide capital through the long tail. And capital is fungible -- for example, if a legitimate crypto-first bank comes along, offering 1% returns backed by insurance on a stablecoin, why shouldn't these open banking players connect to the decentralized ones? In one of the most massive Fintech headlines in recent history, core processing company Fiserv is buying merchant acquirer First Data in a $22 billion stock deal. Much of the thinking about the combination is about scale (12,000 financial services clients plus 6 million merchant locations) and synergies ($900 million in cost, $500 million in revenue). The combination is well engineered in a spreadsheet, and has the strategic rationale of defending a competitive position by vertical consolidation -- "if we own all the Payments and Banking products, we'll touch all the clients". Some folks also mention the pressure on revenues across the industry, as Fintech start-ups create transparency and competition in the space. Consolidating business lines in such an environment makes sense, though perhaps this is an afterthought at the scale we are talking about. There are two angles we want to consider. The first is that enabling financial technology -- i.e., the infrastructure needed to manufacture something financial -- trends towards both utility and monopoly over time. It is a utility in the sense that it should be dirt cheap, easily available, and nobody in their right mind would want to rebuild one (also note utilities are public, as in owned by the government). It is a monopoly in the sense that a single player should win the whole market, consolidate all the costs, and charge only at the margin. As technology evolves, the threat of entry by new players like Alipay and Whatsapp is almost as scary as the actual entry of such players. The infrastructure provider would be wise to compress their own margins to make entry by smarter, faster, better players unattractive. A corollary to this line of thinking is that the long tail of small banks and credit unions rent software from utilities, while firms like JP Morgan and Goldman Sachs get to hire AI PhDs from Google. The other lens to think about is where the innovation and associated growth happen. 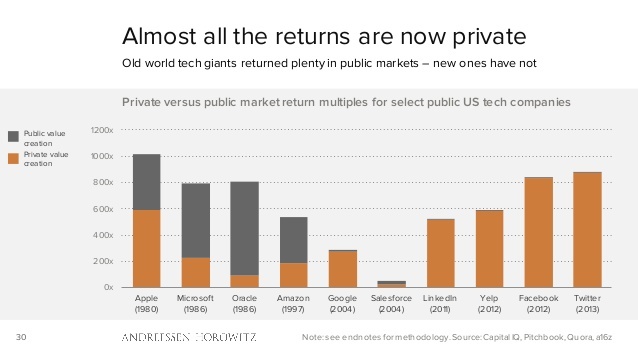 We recently re-discovered 2015 slides from venture firm Andreessen Horowitz, which showed how the flow of investment value in technology -- i.e., the investment returns for taking on some risk -- are happening in large part in the private, and not in the public markets. Said another way, private market valuations no longer have a meaningful ceiling (thanks to SoftBank and Tencent), and therefore private investors get to capture all the capital gains from fintech disruption. To go public merely is to monetize those private gains, whereas in the past going public meant getting capital for growth. That means we expect Payments and Banking industry innovation to stay private, and for large players like Fiserv and First Data to rent or acquire them, rather than lead and source them. In another unicorn story, let's take a look at Plaid, which we discussed just a few weeks back when they raised $250 million at a $2.7 billion valuation. Plaid solved the problem of financial authentication. Some of you may remember that when you connected a third party service to your bank account in the Dinosaur Age, that service would send you a few pennies into the account as a secret pass-phrase. It would be a random number, which you would then tell to the provider as proof you control the account. A few billion dollars later, Plaid has replaced this for tech companies with a simple API call. They do other stuff too -- which, broadly speaking, can be said to encompass all of the "Open Banking" PSD2 regulation in Europe. They just do it in the US, regardless of the wishes of the banks. So we were delighted to see that Plaid used some of its new money to buy Quovo, a strong player in the digital wealth data space for up to $200 million. Unlike Plaid's banking focus, Quovo is strong at understanding investment management data. Take for example the following -- credit card transaction data categorization (Starbucks is a coffee shop), and tax basis reporting for stock purchases (bought at $100). These are different problems and require different teams. 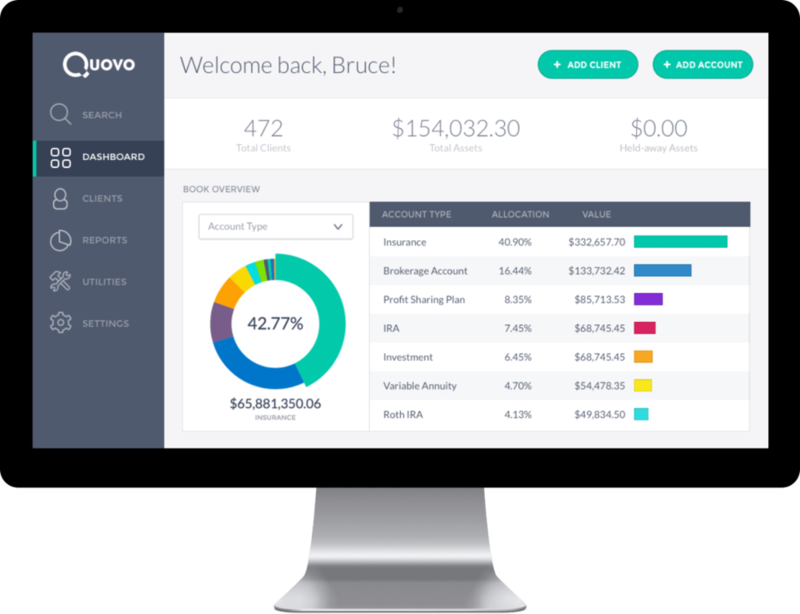 Quovo had built a strong stack on the investments side, powered a meaningful amount of the account aggregation for folks like Betterment and AdvisorEngine. Still, the acquisition likely has (1) much of the consideration in the form of Plaid stock, since venture investors don't love funding acquisitions, and (2) revenue-based valuation earn-outs. The cash outlay in that $200 million, we suspect, is more modest. But also, let's look back and compare. Quovo's closest analog would be ByAllAccounts, which Morningstar bought for $28 million. Someone wasn't good at selling! Plaid's closest analog would be Yodlee, which used to power Mint and was purchased by wealth platform Envestnet for $590 million. In turn, BlackRock has bought into over $100 million of Envestnet stock. These more traditional versions of the same business were way, way cheaper than the Silicon Valley equivalents, and were prescient moves by the incumbents. Yet these are early days for financial data -- we are rooting for the whole industry to open up and digitize. But wait, there's more! Certainly all top-3 neobank champions by geography are hungrily eyeing international expansion . The US is looking delicious for Revolut and N26, Europe is interesting for Ping An as it invests over EUR 40MM into fintech venture studio Finleap, Fidelity wants to open a roboadvisor in the UK, and so on. Technology does not have borders. This is why we are particularly interested in Good Money, funded to the tune of $30 million by Galaxy EOS VC fund (remember EOS raised $4 billion). Good Money is a "banking platform" whose equity will be owned by users when they take certain actions, like opening an account, installing the app, or referring friends. If that sounds like tokenized equity intermingled with Binance referral codes, you're right! One thing we've learned from the ICO mania, other than that some people are sharp-elbowed opportunists who will go to jail, is that human beings like being in communities, and that communities grow way faster and cheaper than "customers". By combining crowdfunding with account actions, this play has a chance to build viral loops, and pioneer a model where a corporate structure (equity) and utopian philosophy (communal ownership of money) have mutually-reinforcing benefits. The blockchain software progress of the last two years makes this possible. Whether it will work or not is another fun story. Last, but not least, is Robinhood and their announcment of banking service to their 6 million mobile-first customers. 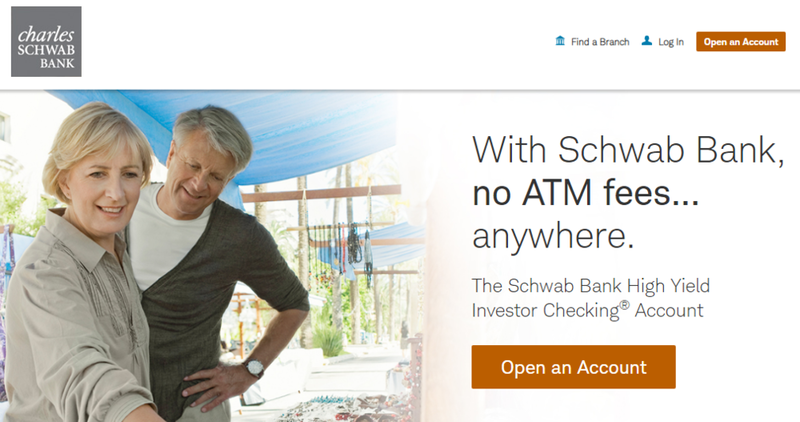 The products is called "Checking & Savings", will deliver a 3% interest rate (vs. Goldman Marcus at 1.85%) and rebated ATM access with a debit card. It is not a bank account and therefore not subject to FDIC insurance. In fact, the whole thing is old hat -- Schwab does this well now (albeit with lower rates on its money market funds), and every HNW wealth management shop ran such an offering for the last 20 years. But you know, Robinhood actually knows how to sell and position a product for its audience, and are willing to burn venture money to deliver a 3% return. Steve Jobs made a killing announcing previously existing products as inventions of Apple -- and he won, because Apple's re-inventions were better suited for the times. Who will you bet on? A great set of symptoms this week for the theme of banking-as-a-service / open banking. To recap, due to regulations like PSD2 or plain old web-forced transparency, banking information and products are getting popped out from behind the curtain and made to compete within the foreign land of tech platforms (i.e., App stores and e-commerce). This means prices falls and economic rents go to fewer winners that have strong APIs, integrations, and a nimble balance sheet. The long tail of banks evaporates into commodity providers as their regulatory and distribution moat falls away. Maybe true, maybe just a fun story! Symptom number one is the $100 million raise of Cross River Bank, of which 75% came from private equity firm KKR. Cross River provides the balance sheet to Affirm, Coinbase, and TransferWise. Those companies in turn are building credit-as-a-service into points of sale (think Stripe), custody and banking for digital assets (dozens of millions of users), and the destruction of international money transfer margins. Finance is correctly integrated as a product/feature within a much more meaningful and long customer journey. This means customer ownership leaves the product manufacturer and goes to the point of actual economic activity. Symptom number two is the $250 million fundraising into Plaid, a data aggregation company, backed by Mary Meeker as her coup de grace from Kleiner Perkins. Remember Europeans, there is no PSD2 in the US, so we have to screen scrape the information out of the protesting bank hands. In the early 2000s, a number of data aggregators were built, the winners of which were Yodlee (bought for $500mm-ish by Envestnet), ByAllAccounts (bought by Morningstar), Finicity and a few others. Plaid's venture valuation of $2B+ boggles the mind, but the answer is in the product. It powers authentication and banking detail provision -- not "personal financial management" only -- for the hungry host of Silicon Valley. Any tech startup that wants your bank account and routing number goes to Plaid, not to Yodlee. Thus is built a major open financial data infrastructure for tech companies in the US. And in Europe, open banking is progressing bit by bit, with the largest incumbents opening the door to barbarians. It's a fun story. Let's review. In the US, the OCC hands out national banking licenses at the federal level. States also regulate and charter banks at the State level. Such regional banks and credit unions are subscale relative to players like Bank of America or Wells Fargo that have a national branch footprint and digital apps. But these small banks have community ties and are protected business interests within the States through lobbying. If the OCC makes it too easy for digital players to create online banks that live in our pockets through mobile phones, regional banks (with poor technology and digital client experience) will lose out. That dynamic actually has not at all played out with roboadvisors, who face the same regulatory jumble with the SEC and local Registered Investment Advisors, but so the story goes. Digital lenders perform a banking function (i.e., lending), but don't have a banking license or FDIC insured deposit capital. Their money comes mostly from investment funds, which is a shadow banking set up. They got around licensing by partnering with Bank-as-a-Service players. Some, like Square and SoFi, have looked at becoming an Industrial Loan Company in Utah -- a sort of quasi bank entity -- but haven't been able to pull the trigger. Neobanks in Europe got around licensing by riding the rails of pre-paid cards from the likes of Visa and MasterCard, pretending to have checking accounts while really just digitizing gift cards. Until now, as Monzo and Tandem have powered up the ability to take deposits via the FCA. So now we come to the point. Recently, the Treasury encouraged the OCC to issue Fintech bank charters, and the OCC opened its doors for business. And immediately, the Board of Directors of the Conference of State Bank Supervisors (CSBS) announced that it is moving forward with litigation against the OCC. Way to kill the vibe! But that has not stopped fintech Varo Money / Varo Bank from getting a conditional de novo national bank license -- it can take deposits, move money and underwrite lending. Almost none of these have been granted since 2008, and so such a charter going to a digital-first player is a shot across the bow (granted, Varo needs to raise $104 million). The other interesting piece is that Varo is going to use Temenos, a European B2B2C bank platform for its core processing. Not FIS and Fiserv, the US versions of the same that power that long tail of State banks and credit unions. That's a big shot across the bow. We love unfair comparisons, but there's a reason behind the madness. Crypto currency exchange Binance is on track to print $1 billion in profits this year, while neobank Monzo has a £33 million loss to show for its £109 million in venture funding. Here's another one: Coinbase now has about $20 billion in addressable (custodied?) assets, while Monzo has £71 million (<£150 per account). One way to think about these companies is (1) store of value in crypto currency, vs (2) facilitating payments and commerce via fiat. And in this way the comparison evens out. The crypto companies to date have failed in making BTC a medium exchange, instead choosing to take economic rents through capital markets. The neobanks have hit the wall of trying to get profitable at scale, though Monzo's 750,000 users and £2 billion in facilitated payments transactions points the way. Looking at Revolut, we see about 2.2 million users and $18.5 billion of transaction volume. That's a medium of exchange story. Two more thoughts on neobanks. The burn should slow down and economics seem likely to improve. On the revenue side, consider that most of the neobanks (Monzo included) started out as pre-paid cards that you load, with a nice mobile interface. That's pure cost, because the Fintech has to pay a third-party for each card while making no revenue of any kind. So Monzo's conversion from pre-paid card to current account under a banking license matters, because they can actually make spread revenue on deposits. 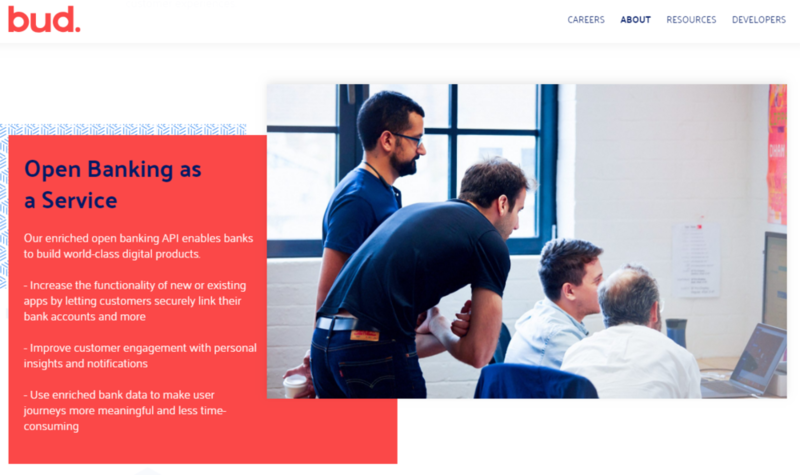 On the cost side, the neobank claims to have reduced the cost of maintaining an account from £65 to £15 -- pretty good operating leverage, but for the upfront cost of acquiring the customer. Since the market is crowded (Revolut, Starling, N26, B Bank, Finn, etc. ), we expect venture funding to continue fueling the turf war. And second, the implementation of Open Banking may not be going according to plan. As a reminder, European legislation PSD2 is supposed to expose incumbent banking data via structured APIs to third parties that want to build upon banking information and money movement. In theory, this lowers the stickiness of bank accounts, allows data to travel safely into aggregators and apps, and lays the groundwork for financial bots and agents that make shopping decisions. Surely, neobanks would benefit from the ability to see and move these traditional assets. Well, maybe not. 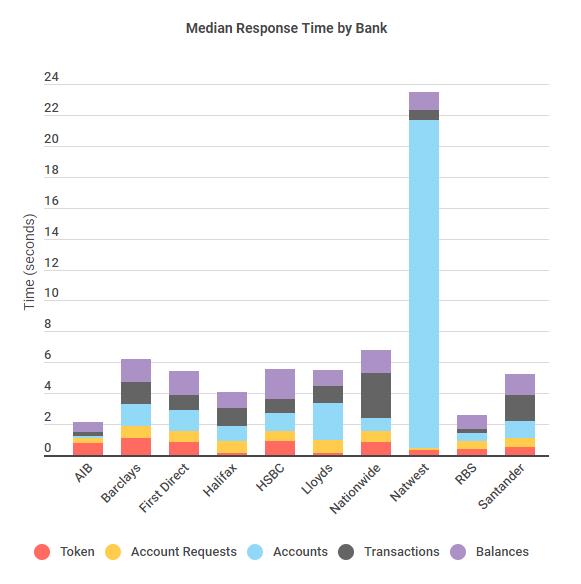 According to blog Open Banking Space, major barriers stand in the way erected by incumbents: "(1) lack of rich data or functionality on the account information APIs, (2) a regressive method coupled with very poor authorisation journeys on the banks’ platforms, (3) technical challenges such as that posed by a lack of immutable transaction IDs’, and (4) the absence of any bank-provided, data rich testing environments." Who will get blamed for this end of the day? The apps trying to build experiences, not the incumbents. 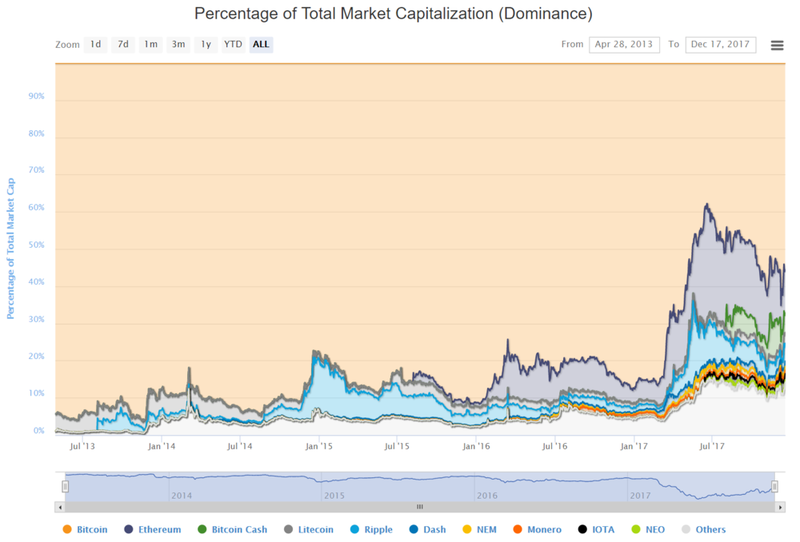 But if you don't want to deal with incumbent infrastructure, there is always Bitcoin. Nothing quite makes human people like us perk up more than being described as "most fertile for machine processing". And yet, that's exactly what Jamie Forese, the president of Citigroup told the FT about the investment bank's personnel. Out of 20,000 operating roles, he sees 10,000 potentially going away over the next five years. Now that 50% is a pretty big number, and not everyone agrees. HSBC, for example, see only 5-10% more automation potential over the same time period. So let's cut the pizza at 25%, and still gawk in disbelief. 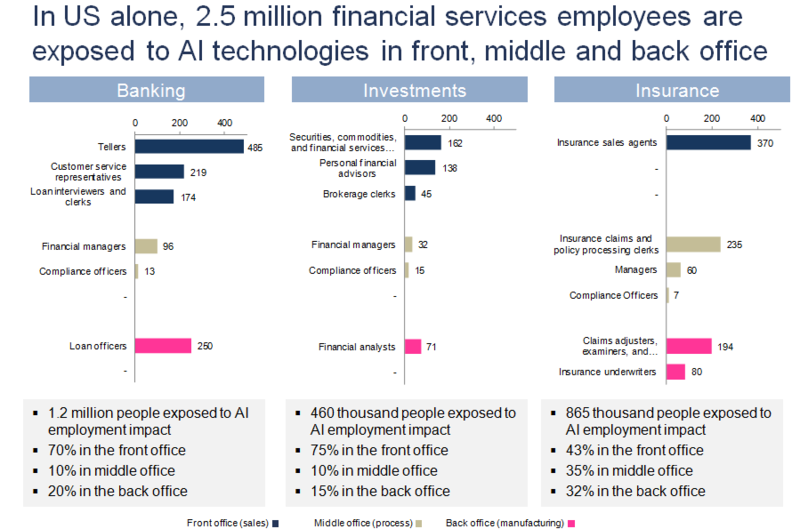 Yet, this live data point is exactly in line with our analysis of what artificial intelligence will do across the financial services sector. In Augmented Finance, we identified $1 trillion of cost at play across banking, investment management and insurance. Behind that cost are those real human people -- 2.5 million of which are in the United States, and about 160,000 of which sit in the middle office of investment and banking organizations. 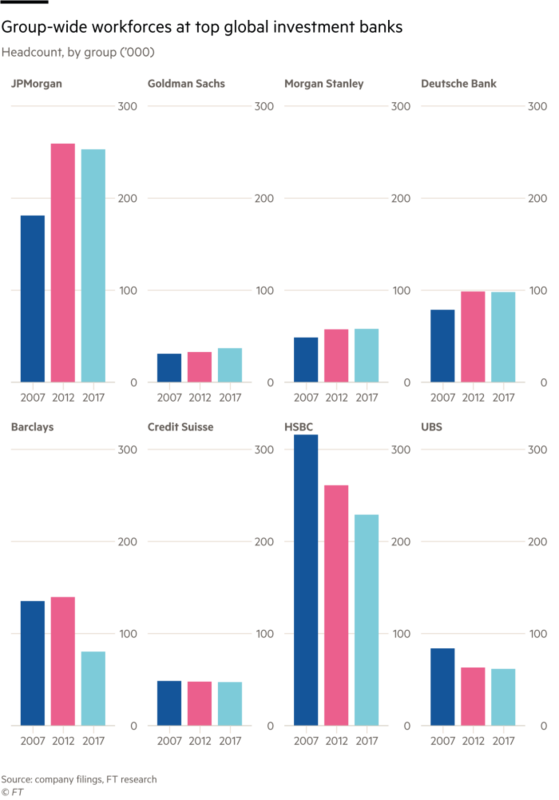 Looking at the last 10 years only, the FT found 60,000 jobs cut from the top investment banks. The way things are headed, sounds like it's time to take programming courses at General Assembly. None of us should be glib about the potential impact on the lives of employees of these companies. One of the ethical questions with which we struggle is -- whose responsibility is the welfare of these employees? Does Google and free machine learning software share a responsbility? Do CEOs of too-big-to-fail finance firms share a responsbility? Do investors looking for cost cutting share a responsibility? Does the consumer, wanting to pay nothing for banking, share a responsibility? And if yes to all, how do we come together to make a world where we celebrate not the cost cutting potential, but instead the potential human productivity growth? Is technology a shield or a sword? ONLINE BANK: Amazon's "Checking Account-Like Product"
Lots of chatter last week about how Amazon is in discussions with JPMorgan about partnering on a "checking account-like product". This is right on the heels of similar discussions with Bank of America about putting capital behind its SME lending business. So since when are banking products or lending products or investment products just a "-like" product. Meaning, don't you have to have a bank to offer the trusted service of a bank account? Don't you have to have a trusted banking brand to hold on to people's money? Quaint questions for the last century. Not really. According to a study from Bain, 74% of 18 to 24 year-olds and 68% of 25 to 34 year-olds expect to buy financial products from technology firms. 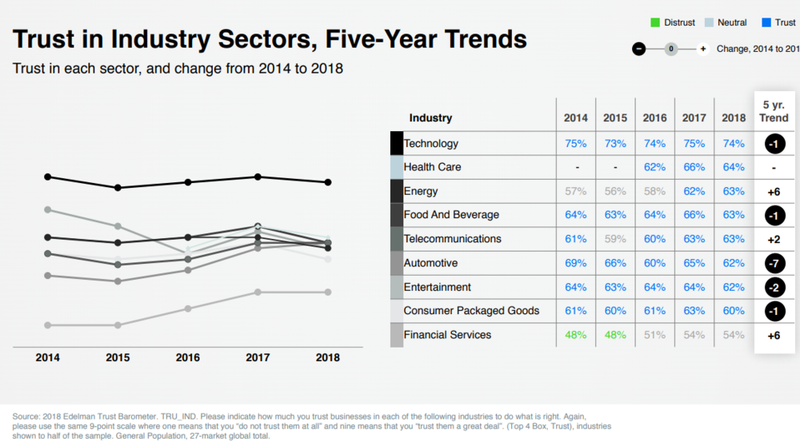 And according to the Edelman trust barometer, people still trust Finance less than absolutely every other industry, while trusting Technology more than any other industry. There goes your core value proposition. The implication of a GAFA sector that offers all the financial products without manufacturing them isn't the safe passage for the financial services industry to the future. Rather, it is the full commoditiziation of financial services, as the main manufacturers of financial products squeeze themselves into the customer acquisition and engagement channels of the big tech AI companies. When the AI knows clients better than anyone else knows clients, financial services are mere features within the rich tapestry of services called Amazon Prime. Why would anyone choose the pain of shopping for and opening a third-party bank account, if one comes pre-installed in our virtual assistants? So you can see how puzzling it can be to read that JPMorgan is investing $20 billion in 400 new branches. Does 75% of deposit growth really come from customer visits to those branches? Do 60% of Americans still prefer to open an account at a branch, rather than digitally? Maybe, but these are decreasing data points in time, part of a larger trend towards digital. As shown below, each year these numbers go down, not up. Or, maybe, JPMorgan recognizes a corporate responsibility for its employees in a world that is moving towards automation and unemployment, and is doing its part in trying to stabilize local communities and the industry's reputation? It's prediction season. But before we get into 2018 and the coming trends (which we'll publish on January 2nd), we wanted to grade ourselves on 2017. How did we do in thinking about the future, relative to what happened? And more importantly, why? None of the prediction text is edited -- we add a subjective accuracy verdict, rationale for the score and an update on the sector. (1) Revival of Cryptocurrency. 10 countries will have issued central-bank backed cryptocurrencies, and Americans will still not understand why that's important. And a multi-billion dollar enterprise will finally try to use the public Bitcoin blockchain as an application layer. We got this one mostly right. At the end of last year, several African countries were looking into using a private labeled blockchain system to run their own crypto currencies, and we thought that would revitalize interest. Today, Russia is working on the cryptoruble, Japan the J-Coin, the US Federal Reserve isat least thinking about it, as are Sweden, China, and many others. Not to mention Venezuela. What can also be highlighted as progress are the capital markets settlement coins between large financial institutions, and the role of Ripple in developing international payments. Certainly the ASX announcement of adopting Digital Asset Holdings for its core trading system resonates here as well. What we were wrong about is just how much reach crypto currencies had into the lives of regular people, and the wealth transfer implications of the public blockchains (at least $400 bilion worth). Certainly none of the central bank issued crypto coins are yet worth anything when compared to Bitcoin. (2) What Roboadvisors? Almost all roboadvice assets will be (by %) at Vanguard, Schwab, and Bank of America. Every large firm in the wealth management business will have gone digital. And we will see a large tech firm unexpectedly acquire an Acorns or Digit, and totally scare everyone that they're getting into finance. Ah, you have to feel bad for the unicorn roboadvisors. Betterment, Wealthfront and the rest have been in this game since 2008 or so. And yet, while their assets have been creeping up to about $5 to $10 billion each for the independents, powered by hundreds of millions in Fintech venture capital, the incumbents are putting up a massive fight. Vanguard alone has more than $65 billion in its digital hybrid, Schwab is likely over $20 billion, and of course Morgan Stanley,Bank of America Merrill Lynch, Wells Fargo, Deutsche Bank and most others are in the game. And that's not to mention the asset managers, like BlackRock launching its digital wealth division. We haven't seen an acquisition of Acorns or Digit, but the partnership between PayPal and Acorns certainly looks like the right theme, and reminds us of Ant Financial and Baidu. (3) APIs Everywhere but Disappointing. In a watershed moment, every single large retail and corporate bank will have a Developer portal with open API keys. However, most of those APIs will do nothing other than pull information. Actionable APIs will be too expensive to use, but Venture Capital firms will overfund companies that tell a story about how to tap into them. So maybe we were a year early with this. The PSD2 (European regulation) date is in January 2018, and by then European banks are mandated to share APIs with the world. We thought that means banks would get ready and open up in advance, but instead we have a smattering of portals from select providers. This Daily Fintech thread has done a nice job of collecting those available. 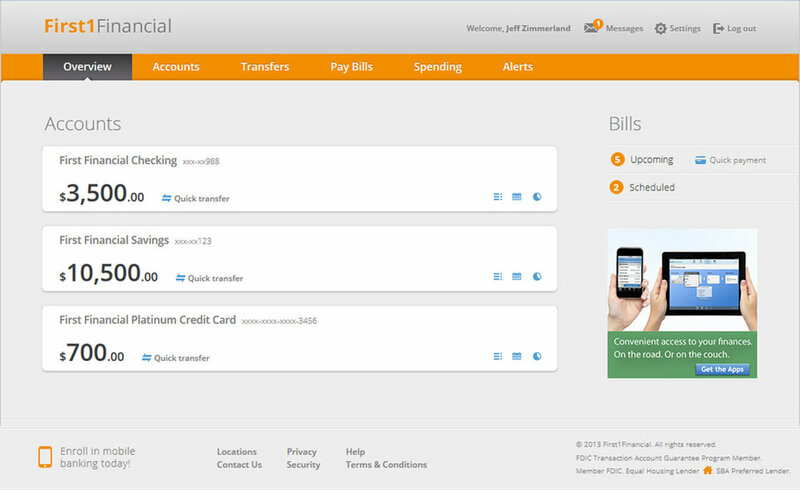 And there are many non-bank financial APIs, for example collected by Programmable Web orLetsTalkPayments. Still, we get a kick from seeing a Deutsche Bank developer portal site open to all. What's happened with this theme instead is (1) the creation of a few bank-as-a-platform startups as a venture backed investment (e.g., Cross River Bank in US, ClearBank in UK), (2) some existential hand wrangling by traditional banks as they watch Amazon move into lending and Apple move deeper into payments, and (3) Ethereum becoming the world's API and programming language for things like crypto-banks. And here is the long form update on all the themes we track and the lessons we've learned this year. Angel and small Series-A funding into B2C roboadvisors will be pretty much $0. Series B funding into digital wealth management companies more broadly will be a little more than half that of 2016. One digital wealth company from the second generation, like Acorns, Stash or Digit, will get bought for a ridiculous amount by an unlikely and surprising bidder. Almost all roboadvice assets will be (by %) at Vanguard, Schwab, and Bank of America. The higher granularity than in the top 3 predictions makes us more wrong. Indeed most roboadvisor funding and interest shifted to micro-investing services (e.g., Stash, Acorns) and financial chatbots (e.g., Earnest, Trim, Cleo). Instead of AI for roboadvice, people do say micro-investing or chatbots. The underlying business change, however, is that those services have now customers/users numbering in the millions. That implies very small accounts (about $1,000) at very large scale. And nobody has been bought just yet at a massive price. Big banks will try to patent troll their vertical solutions on top of the open source projects (Hyperledger, etc.) and will feel a sense of false confidence. It will be the year of lawsuits between the incumbent and startups communities, and open source will win. A blockhain-based production ready system,in either trading or money movement, will replace the legacy tech stack of a multi-billion dollar firm. It will actually increase costs in that year, and observers will draw the wrong conclusions even though the firm is more competitive in the long run. Still feeling pretty good here. While the Bitcoin $ value did become extremely important (climbing towards $20,000 at one point as futures on CBOE were about to launch), the technology of the blockchain has catalyzed over $4 billion in Ethereum-based token launches and thousands of related startups. Banks certainly are trying to patent their enterprise blockchain solutions, but that is unlikely to matter in the long run we think as open source code bases grow exponentially. It wasn't Intel and AMD, but NVIDIA that experienced the most growth resulting from their neural network hardware and developer resources. There is an arms race in determining who will power all our self-driving cars, trucks and augmented-reality devices. That race is not yet over. In terms of image editing and forgery of people's visages, check outFaceApp, which allows you to morph gender, age and other variables in real time. And as this Verge story describes, such algorithms ("deepfakes") are now being applied to adult content. This dangerous technology has not yet hit the mainstream and crossed wires with fake news and propaganda bots, but we have a better idea than ever just how dangerous AI-based communication has become, and the political effects it has had. Incumbent banks will wake up and come down extremely hard on challengers and neobanks. They will fight them on mobile apps, chatbots, instant payments, and user experience. You won't be able to tell apart the website designs of new and old firms. Startups will try to do everything to become financial supermarkets. Expect to see lending, payments, banking, data aggregation and insurance combined in an attempt to grab at least some consumer attention. Regardless, neobanks will struggle getting to any scale beyond 10,000 early adopters. We were right that all established banks will trend towards becoming neobanks, with native mobile apps, chatbots and digital capability. One example of this is payments app Zelle vs PayPal owned Venmo. We also got the trend of unicorn Fintech startups becoming financial markets generally right (though it was easy) -- see SoFi, N26, Paypal/Acorns, or across to China as Ant, Baidu and Tencent build the Fintech of the future. We were wrong on the magnitudes. Incumbents aren't particularly scared of Atom or Monzo, as the tech banks struggle to get licensed or funded. The real story in licensing is the ability to hold deposits to lend out -- you know, to have a business model. The other part we missed is the scale of early adopters. Revolut has a million customers, as does Transferwise. You can say that those are international payments apps, to which we say, yes, you mean global banks? In a watershed moment, every single large retail and corporate bank will have a Developer portal with open API keys. However, most of those APIs will do nothing other than pull information. Actionable APIs will be too expensive to use, but Venture Capital firms will overfund companies that tell a story about how to tap into them. BBVA and Santander will retain their position as marketing leaders of a BaaS offering, and we will start to see apps using their infrastructure. Someone will write a malicious app that crashes one of the API stores, generating tons of press and cyber security premiums. APIs are coming not with a bang, but with a whimper. 2018 will be the year where APIs really get test and implemented by incumbents, so we were off here. BBVA and Santander indeed do maintain their marketing positions, reinforced in a quantitative study we've done on bank innovation. But JP Morgan and Barclays also matter. And the biggest security breach of the year wasn't from these APIs, but from horrible security procedures at Equifax, exposing over 140 million Americans. Virtual assistants will start to appear in business locations, from banking branches to shopping experiences. People in customer service from a major brand will be laid off. Amazon Echo, Google Siri and Google Home will start a nuclear war over the connected smart home. Like with its other products (Kindle, Fire), Amazon will lose its lead, especially as self-driving cars develop their own AI assistants. Hmm, maybe too much science fiction juice in this one. 2017 did see millions of hardware sales of virtual assistants -- Google Home vsAmazon Alexa has Amazon in the lead; Apple HomePod is nowhere. But anthropomorphic AIs are still in early development. As an individual data point, the incredible human renders from Soul Machines are starting to emerge from the uncanny valley. Not so much for the robotic Sophia, who despite being granted citizenship in Saudi Arabia is still a pretty creepy robot. And we're not aware of any hardware acquisitions yet to give the brand-name AIs tangible form. Amazon did buy Body Labswhich does 3D scans of human bodies, but that's probably to sell clothes in Augmented Reality. As consumer protection is rolled back, equity and real estate crowdfunding experience major scams that lead to a public backlash. Crowdfunding technology ends up creating asymmetric benefits for those already in power (think about who can really use Syndicate investing on Angellist, stock earning estimates from Estimize, or invest in Numerai's crowdfunded AI hedge fund). Income inequality becomes sharper despite equality of access to cheap investments. This happened in a surprising but big way with the crypto economy. Consumer protection did not exist at all as Initial Coin Offerings raised increasingly more capital in 2017, fulfilling on the original promise of crowdfunding. The year ended with over $4 billion in ICO funding. Scams and hacks proliferated, from the $170 million Parity failure, to fraudulent ICOs being shut down in China, to the hundreds of millions of crypto locked up in the Tezos litigation. And of course, the story would not be complete without the huge concentration of mining power in Bitcoin, the 170 crypto funds trying to profit from the opportunity, the billions "created" in the Bitcoin Cash fork, and the general distribution of wealth in favor of crypto whales. Black swan outcome. Another massive Initial Coin Offering like that of the DAO, over $50 million, will get people's heads shaking again. This one won't get hacked. Traditional Venture Capital firms will have invested 10% of the amount. Again on the ball here, especially around ICO funding. Think about Filecoin, the CoinList powered SAFT launch where venture investors put in $50 million at $0.70 per coin and regular investors bought $200 million worth at $2.50 per coin (give or take). That's a 20% allocation of the overall raise to private investors, and a massive uptake by the public. More generally, ICOs are a 10x increase on all annual venture investment into blockchain and Bitcoin companies. Venture investment will continue to pour in, increasing by over 50% globally. According to Coverager, venture investment in Insurtech sat at $4 billion in both 2016 and 2017, so the theme is not seeing increased YoY activity. But it's not falling off either. In terms of acquisitions, there is healthy appetite in the sector to modernize and own software assets, with over$10 billion being spent on M&A. One example that fits the bill isTravelers buying Simply Business (online broker for small business insurance) for $490 million. CVS acquiring Aetna is certainly a big deal, but that has more to do with the state of healthcare in the US than artificially intelligent drones powered by machine vision. There is also something to be said for China's Ping An Insurance going public at a $200 billion valuation, but it is a stretch to tie that to the predictions above. And on the scandal point we did get it directionally right. SoFi, which does have an insurance offering via partnership, got into the news on account of the CEO's sexual harassment allegations, which led to his resignation amid the broader transformation of our society with the #MeToo movement. Generation Z will become a bigger buzzword than Millennials. Banks will wonder whether then Snapchat generation even knows if banks exist. So Gen Z is definitely on the radar, and includes everyone born after around the year 2000. But Millennials still reign. The brightest example is Olaf Carlson-Wee, the 27 years crypto-king of Polychain Capital. And the gig economy is still around. Despite setback for companies likeUber in London, most private unicorns are continuing their journey, and the crypto economy in particular is adding more steam to pinballing valuations. The perceived failure of Blue Apron's IPO (falling from a $2 billion offering to $800 million), however, does create a cautionary example. Snapchat certainly did go public, at $24 billion, but has since fallen to $18 billion. But unlike the GAFA tech giants, it has not been perceived as an artificial intelligence leader, and its bet on Spectacles has not gone the way it wanted. But the big tech firms have indeed gone further into finance -- from Amazon's SME lending, to Apple and Facebook messaging payments, to Google's machine learning and financial cloud. We would highlight Amazon's digital lending moves as particularly threatening to incumbents, given their higher quality data for automated underwriting. Millions of virtual reality headsets will hit homes across the United States, leading to an explosion of VR apps powered by Valve's Steam store, Playstation, and Google. Payments in VR will go live in Asia first, and will set the default behavior for the rest of us to follow. Credit card networks will open VR incubators or invest in VR companies. This is one is almost right, helped by Apple's latest hardware. Millions of VR headsets have indeed been sold to American consumers, but the general sense is that VR is not ready for mass adoption. Augmented Reality, however, has absolutely landed in the hands of consumers in the form of iPhone X, which comes with a ARkit, a development kit of software engineers. Ikea, Amazon and other retail apps are thinking about how to implement AR commerce, which we continue to think will drive payments activity. And of course, don't forget Alibaba's $20 billion revenue "singles day" shopping spree, in part powered by this technology. Unsexy businesses in the "old economy" of manufacturing physical objects will position themselves as technology companies that generate terabytes of proprietary data. Hedge funds and other investors gladly pay for that data, repeating the experience of expert networks. Self-driving cars continue to beat performance expectations and end up in production-mode on roads all across the world, leading to unemployment and outrage. Governments, trying to stem the bleeding, file lawsuits against tech companies for breaking regulations. It doesn't work. Broadly speaking, Alternative Data is a big growth area with many companies looking for ways to monetize their internal data exhaust. But the role of old manufacturers is perhaps not as drastically helpful as we had hoped (yet). As for self driving cars, we got it backwards. For some reason, the US House of Representatives is in favor of looser regulations for self-driving cars, and had passed a bill as such. Perhaps the auto industry as a whole, and not just Tesla, is seeing this as a way to boost its fortunes. And the cars aren't quite in production mode at scale, but may hit the roads by 2020. Human addiction to technology will reach a new height. People will spend more than 12 hours a day on their screens. The cost of sequencing the genome for an anonymous consumer falls to $25. Genome data can be made available between services via API. 3D printed organs will be implanted into human patients successfully. Scientists will claim they have simulated a full rat brain, which will become easier due to newly available hardware. There will be no implication in the physical world from this discovery. Yep. People now spend 12 hours per day on media. The cost of sequencing a genome is somewhere between a $1,000 and $70, depending on granularity. Organs are not routinely 3D printed yet, but a Wisconsin company offered to implant NFC chips into its employees. And no, there are no stimulated rat brains yet -- but here's a worm brain in a robot body and optical neural nets on a silicon chip. We just came back from Money2020 in Europe, Copenhagen. It was a packed event with entrepreneurs, executives from financial services companies, and a few large tech companies (e.g., Google & Samsung). Our first takeaway is the difference between the American and the European events. The Las Vegas conference is organized chaos, with a sea of hustlers and deal makers trying to get access to hard-to-access investors and incumbents. Europe felt different, as if there already was a club with both incumbents and Fintechs in it, collaborating to build a more efficient infrastructure, and not looking to disrupt market share. More people wore suits. Second, PSD2 in Europe will open up bank data through APIs in about half a year. GDPR will require privacy protections that many companies are hard-pressed to honor. This means that Fintech solutions targeting these areas are in direct demand. Conversations about open banking, and what will happen with bank-as-a-service, were paramount with speakers like Chris Skinner excited about solutions like ClearBank (UK clearing bank with APIs) and solarisBank (German BaaP solution). The US is lagging in such conversations, probably because banking in the 50 states is marginally better than banking across European countries with different regulations and rails. Last, we presented the Autonomous NEXT view on how digitization will effect startups, financial services companies and high technology firms. Our presentation raised the question of how GAFA think about financial services and where that fits into the attention economy. We established that digitization has reduced revenues by roughly 50% across impacted industries, and the remaining revenue became digital, subject to winner-take-all dynamics. And although it's unlikely that tech firms will target the manufacturing of financial products as a standalone, it is likely that they will own much of the financial data of the world via enterprise blockchains, and control the client interaction through emerging communication interfaces. Check out the slides for the presentation here.